The Relief Aire "True" Low Air Loss Support system incorporates the newest technologies in pressure relief mattresses. Designed to treat and prevent Stage I – IV pressure ulcers, the low air loss system gently massages the epidermis while continuously changing contact points with the skin's surface. 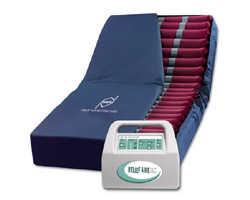 This helps to eliminate the development of pressure ulcers and provides easy and effective treatment. The Relief Aire is made of the highest quality materials making it durable and reliable for Long Term Care, Homecare, and Acute Care environments. Standard model maximum weight: 300 lbs.